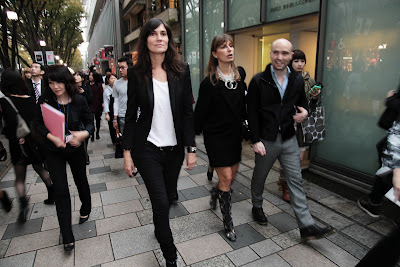 5th November 2011 - TOKYO – Thousands of shoppers in Tokyo joined Editors of Vogue from around the world on Saturday for a very special Fashion's Night Out event in a bid to boost spirits and sales following the earthquake and tsunami which devastated Japan earlier this year. Following an official opening ceremony at the Omotesando Hills shopping centre with the Vogue Editors, models, celebrities and designers including Christopher Bailey, Michael Kors, Giambattista Valli, Roberto Cavalli, Derek Lam, Lucien Pellat-Finet, Kris Van Asche, Peter Copping, Stuart Vevers, Ai Tominnaga and TAO, all took to the streets where over 400 brands were participating in this unique Fashion’s Night Out. A celebration of fashion in the shopping meccas of Omotesando, Aoyama and Harajuku, stores were hosting styling events, specially commissioned installations, designer appearances, limited edition items, as well as Fashion’s Night Out product on sale with proceeds going to Children Without Borders among other charitable initiatives. Brands participating included Prada, Burberry, Bottega Veneta, Louis Vuitton, Dolce & Gabanna, Ralph Lauren, Missoni, Tod’s, Emporio Armani, Dior, Sacai, Tommy Hilfiger, Rag & Bone, Gucci Comme des Garcons, Miu Miu, Loewe, Fendi and Chloe. As much an attraction was the Vogue Editors themselves, as they walked the streets from store to store amongst crowds of shoppers. Editors attending included the host Editor, Mitsuko Watanabe, Editor of Japanese Vogue; Franca Sozzani, Editor of Italian Vogue; Alexandra Shulman, Editor of British Vogue; Emmanuelle Alt, Editor of French Vogue; Angelica Cheung, Editor of Vogue China; Christiane Arp, Editor of German Vogue; Yolanda Sacristan, Editor of Spanish Vogue; Viktoria Davydova, Editor of Vogue Russia; Kirstie Clements, Editor of Australian Vogue; Eva Hughes, Editor of Mexican and Latin American Vogue; Paula Mateus, Editor of Portuguese Vogue; Myung Hee Lee, Editor of Vogue Korea; Seda Domanic, Editor of Vogue Turkey; Rosalie Huang, Editor at Large of Vogue Taiwan: Anaita Adajania, Acting Editor of Indian Vogue, and Anna Harvey, Vice President and Editorial Director of Condé Nast New Markets, representing Vogue Brazil and Greek Vogue. Tokyo’s unique Fashion’s Night Out was conceived by Jonathan Newhouse, whose idea it was to bring the Vogue Editors together. This was the culmination of the Fashion’s Night Out season 2011, having taken place in seventeen countries in September. Record crowds have participated in a nocturnal festival of shopping in a street fair atmosphere in cities including New York, London, Paris, Milan, Madrid, Mexico City, Shanghai and Berlin, and the event has been credited with raising spirits and retail sales as thousands flock to the hundreds of stores open late. Originally created by American Vogue editor Anna Wintour in 2009 during the depths of the economic crisis, Fashion’s Night Out was born out of a desire to give joy to Vogue readers and to help improve sales for the designers and retailers of the fashion world. Sponsors for Fashion's Night Out Tokyo included Audi Japan, American Express International, Inc., Perrier and Lenovo (Japan) Ltd. Partners include Japan Tourism Agency, Harajuku Omotesando Keyaki Organization. Condé Nast, a division of Advance Publications, sets the benchmark for multimedia publishing excellence. Condé Nast currently operates in 25 countries, publishing 126 magazines, 98 websites and over 70 tablet and Smartphone apps under iconic brands such as Vogue, GQ, Glamour, Wired, Condé Nast Traveller, and Vanity Fair. Recent launches include Vogue in Turkey, Condé Nast Traveller in India and Russia, GQ in Brazil, and AD in China.